The Dead Sea is the saltiest body of water in the world with a mineral concentration some 10 times greater than any ocean. 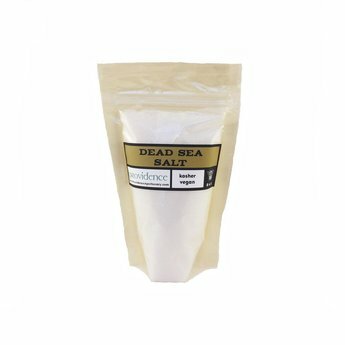 Dead Sea salt is a wonderfully complex assemblage of minerals and chemicals including bromides, iodine, magnesium, sodium, calcium and potassium. Most of these minerals are important regulators of cell activity and muscular function. Dead Sea salts have been used to relieve muscle soreness and help restore proper fluid levels in the body. The rough nature of the salts lends itself well to use in body scrubs. The water of the Dead Sea is so dense from the high concentration of salts that one can easily float without the use of life jackets. Keep out of direct sunlight and in a dry location. Excessive humidity can cause the salt to cake and harden.